The Obama administration's push to settle a tense nuclear standoff with North Korea is being spearheaded not by soldiers on a battlefield or big-name diplomats but by government officials knocking on the doors of banks throughout Asia. The Democratic White House's effort borrows a page from former President George W. Bush's Republican playbook: Pyongyang unwilling to bend? Negotiating partners wary of tougher sanctions? Then bypass messy international diplomacy and hit the North where it hurts: its foreign bank accounts. American officials are traveling around Asia, targeting private banks that might have North Korean ties. They hope to block money that could be used for missiles and nuclear bombs and, ultimately, to drive North Korea back to stalled disarmament talks. The strategy is simple, according to interviews with past and current U.S. officials responsible for implementing it. And, they say, it works, which has not been the case with tortuous nuclear negotiations with the North. The officials tell bankers that North Korea uses its accounts to hide counterfeiting of U.S. currency, to launder money, to smuggle cigarettes and drugs. The banks could face potentially dire consequences if they are seen as helping illicit activities. U.S. officials say bankers find their visits difficult to ignore. "It's having an effect. We think that the word is out," said Philip Goldberg, President Barack Obama's point man on implementing new United Nations sanctions on North Korea. The effort encourages banks to "give heightened scrutiny to any transaction that may be coming through with a North Korean label on it." Juan Zarate, a senior counterterrorism adviser to Bush who helped develop the strategy, said in an interview that the U.S. effort to "harness the financial furies" is "making it very uncomfortable for the North Koreans to do business at all beyond their borders." Some, however, question whether the strategy is counterproductive and could cause North Korea to lash out or become more entrenched. "Financial sanctions used in the service of regime change is a very, very dangerous weapon, which could lead them to military retaliation," said Selig Harrison, a North Korea specialist at the Center for International Policy. He has visited the North 11 times to meet with senior officials. As a senator, Obama criticized the Bush administration's handling of North Korea, although his main objection was to its early reluctance to engage in direct talks. His aggressive use of Bush's financial pressure strategy is an acknowledgment of its success in getting the attention of a country that has built a national ethos around defiance in the face of unrelenting outside pressure. Obama also has few alternatives: Military force against the huge North Korean army would be catastrophic; diplomatic efforts are unsure. Coincidence or not, as the United States steps up financial pressure, the North has begun making conciliatory moves, showing a new willingness to resume nuclear talks. Still, U.S. officials insist the tough stance will continue until the North takes "irreversible steps" to scrap its nuclear programs. Merely returning to disarmament negotiations will not be enough, they say. The officials will not say which banks they have visited, recognizing the possible stigma attached to the meetings. But they say they meet frequently with bankers at their banks, in regulators' offices, in Washington, as well as talking over the telephone. 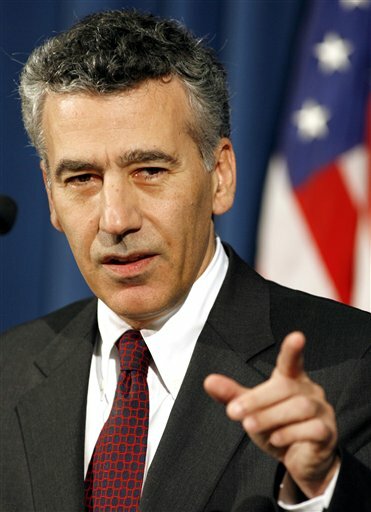 Stuart Levey, Treasury's undersecretary for financial intelligence and an architect of the Bush and Obama administrations' North Korea strategy, said in an interview that he and his colleagues provide banks with important information about North Korea that they would not be able to obtain without U.S. government cooperation. Banks, Levey said, "spend a lot of money in trying to protect themselves from ilicit activity. Governments should try to help them." Banks may ignore that "help" at their own peril. The Obama administration can point to a U.N. resolution that decrees financial sanctions against designated entities that may be involved in missile or nuclear weapons financing or proliferation. Victor Cha, Bush's former senior Asia adviser, said the resolution makes "a huge difference" in getting banks' attention. On Friday, the State Department announced that Goldberg was traveling this week in the Middle East to push for stronger enforcement of the U.N. decision. The United States is worried about North Korea selling weapons and nuclear technology in the Middle East. The White House also has at its disposal a powerful cautionary tale about the dangers of dealing with the North: the story of Banco Delta Asia, a bank in the Chinese territory of Macau accused of helping North Korea launder money and other illicit activities. The threat of the U.S. blacklisting BDA in 2005 effectively led to the North being severed from the international financial system, as institutions worried about jeopardizing their U.S. connections voluntarily stopped dealing with the bank and the North. Even if they have little risk of being blacklisted, financial institutions try to avoid activities that would tarnish their reputations and scare away current or future customers. Associated Press writers Jeremiah Marquez in Hong Kong; Ambika Ahuja in Bangkok, Thailand; Eileen Ng in Kuala Lumpur, Malaysia; and Alex Kennedy in Singapore contributed to this report.